After the great succes of the first Queer Dance Camp in 2014 pinkballroom offers also in 2015 a training camp specially for equality dancers at the last weekend before christmas. 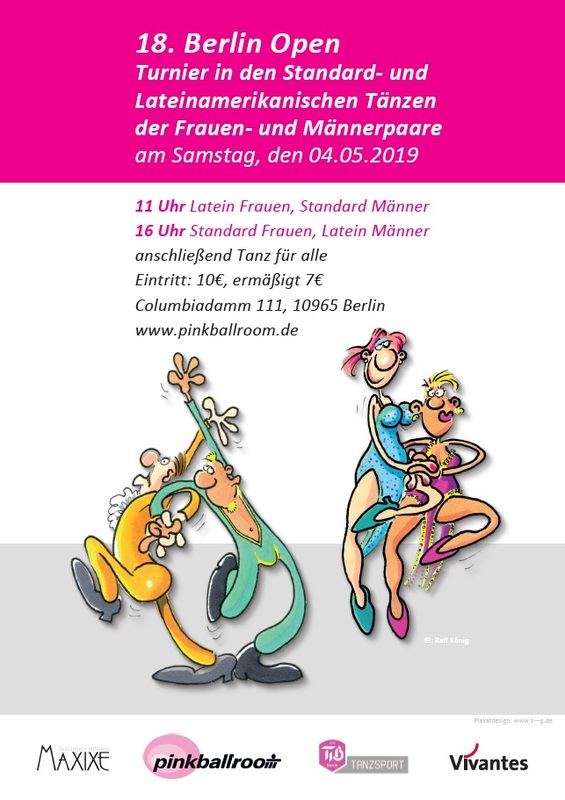 This camp addresses equality couples from Berlin, Germany or other countries, whether they are dancing competitions (in all classes) or not competing in tournaments. The training will be held/amended in english. You will find more information about the trainers here. Together: Dancers from different courses and clubs will meet together and learn together and from each other. Suitable for all of us: All trainings are suitable for all participants – independent from the individual focus in latin and/or ballroom. Learning: The trainers will teach special themes at the 3 days with more time and more in depth as in daily routine. Something else: With elenments of tango argentino & belly dance we broaden our mind and gain impulses wfor the „real;-)“ dancing. Fun: The weekend will close with a show in the legendary café fatal. Who wants to be part of it: Everyone is welcome. Detailed information about the content of the trainings you will find here. You will find the preliminary programme here and information how to get there here. interested in the dinner get together saturday evening? Do you need hosted housing? After registration you will receive further information referring to the payment.